This is a delicious gfcf, gluten free, family-friendly recipe! It is also (if you double check ingredients!) a wheat free, dairy free, soy free, egg free, fish free, shellfish free, corn free, and vegan recipe. My grandmother makes a recipe similar to this, but hers has graham cracker crumbs in it. I adore hers, and these are pretty darn good, and without the gluten or dairy! Combine ingredients through salt. Mix well. Scoop into walnut-sized balls, and place on waxed paper. Chill in refrigerator (or back porch in winter) for at least an hour. Melt the chocolate & shortening together, and use a fork or spoon to dip the peanut butter balls in the chocolate. Decorate each one with a peanut on top. Chill again, then eat! Mmmm…. Put ingredients through Karo syrup into a heavy saucepan with a candy thermometer. Stir frequently until it comes to a boil. Allow it to boil for about 20 minutes, until it reaches soft ball stage. Remove from the heat, and place pan in a bowl of cool water. Stir in the vanilla and nuts. Keep stirring until it becomes thick and stops looking glossy. Pour into a greased 8×8 pan, and let set. Cut into squares and serve. Delicious! This isn’t even really worth a recipe, but it’s an easy candy, and it looks nice. 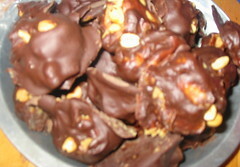 Broken up and put into petit fours cups or holiday ziplocs it is a great gift candy. Mix the two together, then spread out on parchment paper, wax paper, or silpat. chill. crack into pieces and serve. I hear this is really yummy from my family and friends, but I don’t like candy canes. I’ll take other people’s word for it! This is more a descriptive essay than a real recipe. No exact amounts. On a cookie sheet or plate, put mini-muffin liners. In a medium-sized bowl, warm some sweetened coconut. Add a little vanilla, and then while stirring drizzle Cane Syrup on top, until the mixture has a bit of a yellowish tinge and it sticks together (usually about 1 soup spoon-full). Spoon 1 teaspoon of coconut into each muffin-liner. 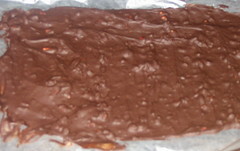 put 2-3 almonds on top, then glop chocolate on top of that. Put the plate/cookie sheet into the freezer, and about five min later, eat. This is my adaptation of my mother-in-law’s recipe. It’s divine, and tastes like it is much more work. Combine sugar and coconut milk in a heavy saucepan with a candy thermometer. Cook over medium heat, stirring regularly until it reaches soft ball stage. 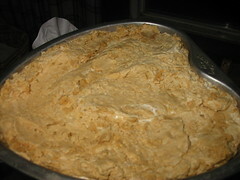 Remove from heat and stir in the fluff and peanut butter. Mix well, really beating it together. Grease an 8×8 pan, and pour the fudge into it. Let set until firm. Slice into squares and serve. Extra-special variation: Sprinkle the still-hot fudge with chocolate chips, and as they melt, swirl them on top of the fudge. Yum. I have another recipe that is free of eggs and corn. This recipe is gfcf, gluten, wheat, dairy, tree nut, nut, and can be soy free. Combine all ingredients through margarine in a heavy saucepan with a candy thermometer. Mix and bring to a boil over medium heat. Keep stirring intermittently. Allow the mixture to boil for several minutes (more than five), until the thermometer reads “soft ball stage”. You can’t just go by time, as coconut milk reacts a bit differently and the timing for evaporated milk doesn’t quite work. Remove from heat, and mix in the vanilla and the chocolate chips. Stir until well combined. Pour out into a greased 9×9 or 8×11 pan. 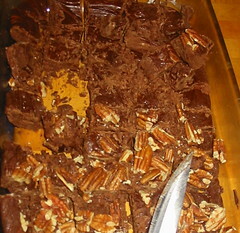 If you are not sensitive to nuts, you can combine about 1/2 cup pecans/walnuts after adding the chocolate, or you can sprinkle some over the top of the pan of fudge. 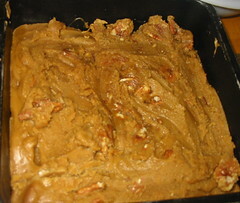 This recipe is a from-scratch fudge, not using the marshmallow fluff that has eggs and corn. It’s delicious, and while it’s trickier than the other type of fudge, if you can’t have eggs and/or corn, you can eat this! It’s definitely worth the work. Mix the sugar, coconut milk, chocolate, cane syrup and boil rather slowly, stirring until the ingredients are well blended. Boil to the soft-ball stage, or 236 degrees. Spread it in a glass pan oiled with coconut oil and when it hardens cut it into squares. Store in a pan/tupperware covered until it is gone. Do NOT put it in the fridge, as that is too moist, and it will get mushy. I love candied nuts. Unfortunately, most commercial candied nuts contain wheat starch for some unknown reason. I am sure there are dozens of recipes out there for candied nuts, but this is one I just threw together when my sweet tooth and almost-empty cupboard collided. They are fabulous as a snack, over canned peaches, and over ice cream. This is a delicious gfcf, gluten free, family-friendly recipe! It is also (if you double check ingredients!) a wheat free, dairy free, soy free, egg free, fish free, shellfish free, corn free, and vegetarian/vegan recipe. Images will be up later today! Melt the butter over medium heat in a small to medium sized non-stick skillet. When the butter is melted, add the brown sugar, and stir with a spatula (a silicone one is best, as this will get hot). Add the cinnamon and salt, and keep stirring. Add the nuts, and stir carefully. Keep the heat at medium, and stir intermittently, gently combining the candy mixture with the nuts. Cook for about another 5 minutes, still stirring and mixing. While the candied nuts are cooking, prepare a cookie sheet with a sheet of parchment paper or a Silpat Silicone Baking Mat. Pour the candied walnuts onto the parchment/silpat, and make sure they are scattered and separated over the sheet – if they clump, you’ll have a big lump of praline, which is yummy, but not easily scattered! Let cool, and then eat. If you have some will power, you can keep them in an airtight jar or container, or in a zip-top bag for easy snacking. yum. I make these for friends and family every Christmas. If you can do dairy, substitute cream for the coconut milk. This is a delicious gfcf, gluten free, family-friendly recipe! It is also (if you double check ingredients!) a wheat free, dairy free, soy free, tree nut free, peanut free, fish free, shellfish free, and South Beach phase 2 safe recipe. Melt chocolate in a double boiler. When it’s melted, add the coconut milk and stir until combined, then let cool. Measure sugar into large bowl, mix with egg white. Add cooled chocolate, and stir to combine. 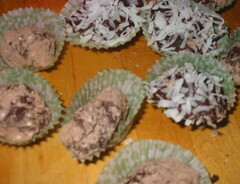 Shape the chocolate mixture into balls, then roll each chocolate ball into a topping. (sometimes this doesn’t work well, and you end up simply dumping lumps of chocolate into the topping, then spooning it out. They still taste good, even if they are a bit flat. Let cool and harden on a piece of wax paper. Turn once or twice while hardening so they don’t become flat. Store in an airtight container. Yum! (If you want to make twice as many, do it twice rather than doubling the recipe, because the chocolate needs to be a certain temperature to work with, and a double batch doesn’t work right).